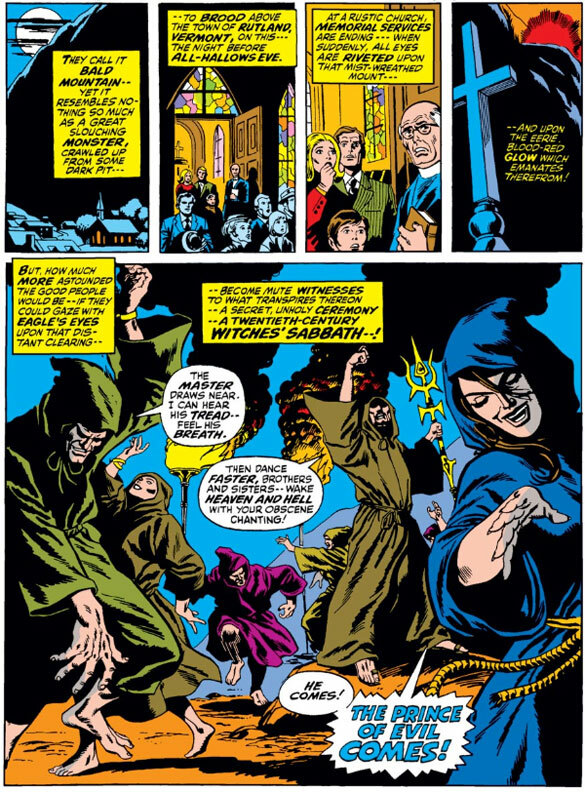 The Defenders grew out of necessity, as Roy Thomas had started a story in Dr Strange #183, and had the book cancelled out from under him. He continued the story in the other books he was writing: The Sub-Mariner (#22) and The Incredible Hulk (#126). It proved popular enough he gave them another go 'round, in Subby #34-35, before giving them a group tryout in Marvel feature #1. The rest was non-history! Synopsis: Thanks to Eternity, in the previous couple of issues, Dr Strange is no longer Stephen Strange. he had revealed himself to the world, then Eternity changed him to Stephen Saunders, bending reality to fit. he has received a telegram from an old friend, Kenneth Ward, asking for his help. He goes to visit and finds a weakened man, guarded and cared for by three others. He tells Strange of a journey to the Himalayas, where he found strange idols and perils. The three warders are revealed to be servants of the Undying Ones, powerful beings from other worlds. He is too late to save his friend; but, Dr Strange goes off to protect the world from the Undying Ones. Synopsis: Subby has returned to Atlantis, after aliens captured him and operated on him, closing his gills and making him a pure air-breather. A scientist will restore his ability to breathe under water. While under anaesthetic., he recalls what happened, then gets a summons about an ancient idol. He wakes up and crashes out of his oxygen chamber, swimming his way to Boston, where he grabs some threads. He comes to Kenneth Ward's house and meets a young woman. He is attacked by a demon and finds the girl out cold. Investigations lead him to and old cemetary, where the grave of a judge from the Boston Witch Trials (Salem must have asked for a change of venue) and finds the missing idol. Dr Strange turns up, reveals the girl is a demon and the idol is for the Nameless One. 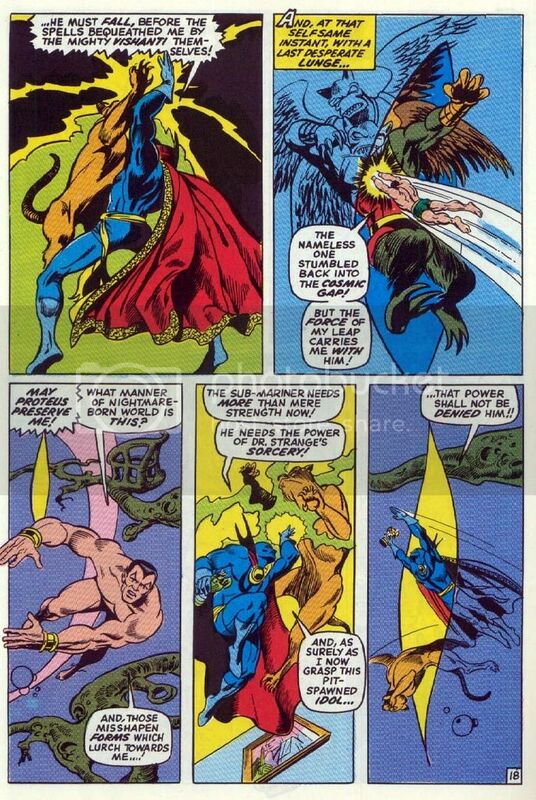 Strange briefs Namor, then they discover that the cat the girl had is also a demon and the Nameless One gets released. The duo shove them back across the dimensional rift, then Strange sends Subby back. Synopsis: The Hulk recently faced the Absorbing Man and is now unconscious, as Bruce Banner. he is found by a young couple, Jack and Barbara, and taken to a house on the hill. There, their boss, Van Nyborg, has them bit him in a room and we get dialogue that suggests these guys are into the occult. Next thing you know, everyone is dressed up and Van Nyborg looks like a wizard, ordering Barbara to give Bruce the Vapors of Valtorr (most likely via the Bong of Chong). Bruce is sent spinning and ends up in the Undying Ones' dimension, where Strange is a captive of the Nameless One. He sicks his champion Night-Crawler (not Kurt Wagner) on him; but, the Hulk doesn't appear. Barbara objects to things and Van Nyborg has her dumped through the portal, where Night-Crawler grabs her. Banner Hulks out(Whatcha gonna do when Hulkamania runs wild on you?) Night-Crawler responds with his Scepter of Shadow (He's got a foreign object, ref!) and turns the fight into a Lights Out Match. Hulk stumbles around and gets knocked off the floating rock; but, grabs a stalactite, which he punches, releasing light (somehow). Barbara hurls a rock and smashes the scepter's orb (We just can't have nice things!). He turns all Macho Man on Miss Elizabeth....er, Barbara, when the Hulkster comes to the rescue. Night-Crawler hits Hulk with a sonic "Ooooooh, yeeeaaahhhh! "; and, before he can snap into a Slim Jim, the Hulk claps his hands and hits him with a concussion wave. It rips up Night-Crawler's rocks and they end up on Dr Strange's prison. Night-Crawler turns babyface and attacks Bobby Heenan....er, the Nameless One and they fall into his realm. Strange returns Hulk and Barbara to their realm, then takes Hulk to the Sanctum for some vitamins and payers. Strange gets Banner some clothes, then heads off to find a new life, away from Dr Strange. Banner goes looking for his backpack and to thumb a ride, before McGee shows up. Thoughts: Meh.....Really kind of anti-climactic. What started out as a Lovecraft pastiche ends as Hulk smashing some goon. It really doesn't hold together as a whole story. Whatever Roy had planned got lost in these other titles, with their own events to serve. Also, Trimpe isn't Colan, when it comes to mystical stuff. he's fine with the smashing; but, not the more subtle stuff. Jack and Barbara will return and be major components of the Defenders. Ele Jefe de San Pablo tells the idiotas that they have angered the Hulk, when he just "Vanted to be alone!" Subby is watching via a monitor and sees the Hulk in action and reveals that San Pablo is building a weather-control experiment that endangers everyone. He doesn't like bringing in the Hulk, but, then sees that Silver Surfer is looking for some waves. Subby interupts him and he also goes all Garbo. They fight and Subby proves to have the cooler head (There's a switch!). He tells Surfer about the weather device and they head off together. 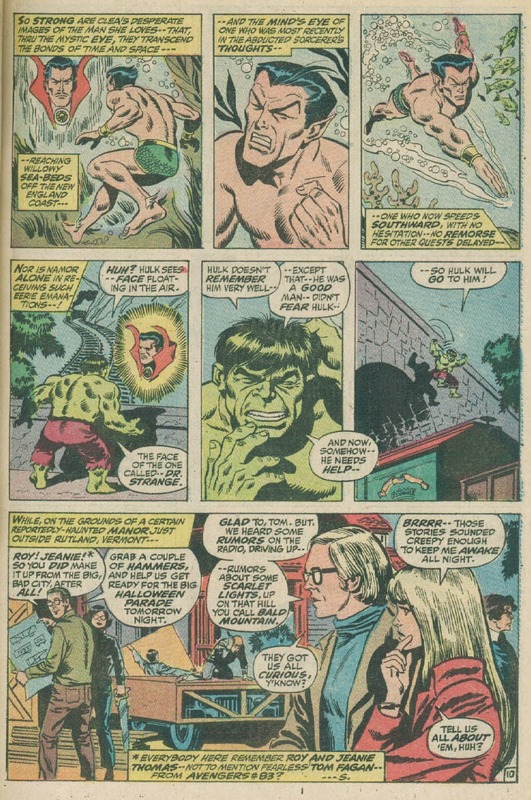 Hulk finds a ruined temple and adopts it as his home, until Surfer and Subby fly too near and he attacks. Hulk smash, Imperious Rex, Cowabunga and the fight is interrupted by the artillery of the government forces. The trio fight back, the people see their chance to overthrow the generalissimo and before you can say Viva La Revolution, the general is a prisoner and the Titans 3 fly off. 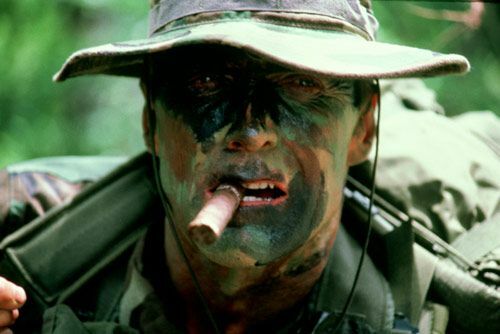 The weather experiment is still a threat and it turns out to be a UN project, run by the most gung-ho soldier this side of Gunny Highway. Subby melts the troops weapons and they make like France and haul derriere. A quick call to the UN, a non-binding resolution to issue a scolding, and now the trio are really in for it. The Secretary-General calls up the Avengers and they head out. Meanwhile, Subby has summoned help and the Atlanteans show up to dismantle the weather device, including Lady Dorma. 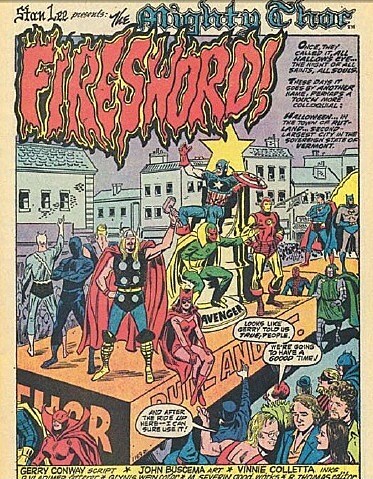 The Avengers show up, we get a face off, Subby tries to play peacemaker (Will wonders never cease?) and Goliath (the known hot-head Clint Barton) takes the first shot and it's on! Hulk Smashes, Thor smites, Iron Man repulses, Surfer blasts, Goliath stomps and then the gun ho soldier turns up and launches a firefight. Lady Dorma gets them to stop, the scientist finish their work, everyone is summoned and the Atlantean boffin demonstrates the danger of the device and the soldier issues apologies. Hulk gets pissy and buggers off and Surfer goes to shoot some curls, while Subby and Dorma head back to plan a wedding. The Avengers head sheepishly home. Thoughts: That's a bit more like it. This was obviously planned as a team-up and it flows fairly well, with plenty of action and typical Marvel misunderstanding. Tr Titans 3 save the day and split back up, setting the stage for a full blown tryout of a regular team. Wow, I never knew Strange ever wore a mask. I guess it wasn't for long? Strange is chilling in the Sanctum, after reclaiming it from Baron Mordo (as seen in the back-up story, at the end of the issue, after a Sub-Mariner reprint) when he gets a mystical 911 call.and his astral form heads out. At a hospital, he finds the bandaged form of alien techno-wizard Yandroth. After their last meeting, in another realm, Yandroth had been hurling through a world where order and logic didn't exist. he made it back to Earth, somehow, and combined science and magic to create the Omegatron, which will set off all the nuclear stockpiles on Earth, destroying it, as a massive suicide. Strange says Bugger That! and heads off to get help. He recruits the Sub-Mariner and Hulk (after a brief squabble) and they follow Strange's only clue to Point Promontory and a new lighthouse. Strange reveals an invisible energy barrier and sends the Hulk to smash and Namor to destroy. 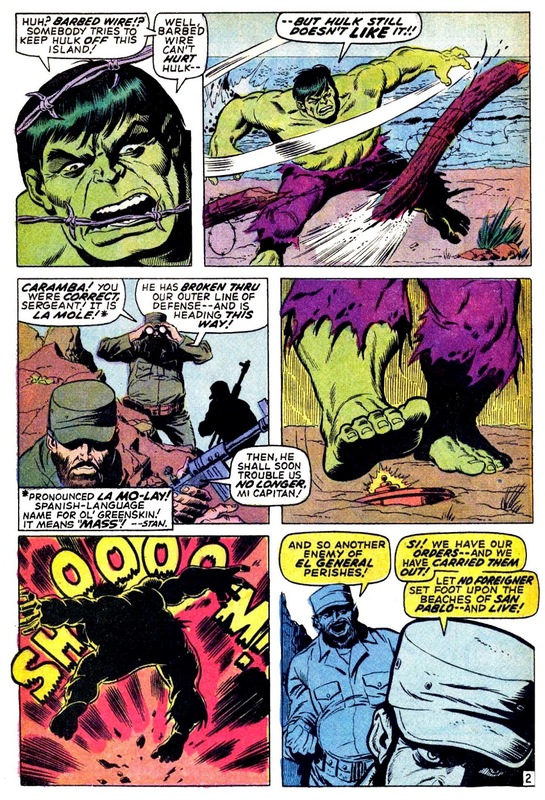 Hulk goes for a frontal assault and gets an acid hot foot and flamethrowers. namor goes underwater and comes into a passageway, where he gets the old Death Star Trash Compactor Treatment. They get past the traps and Strange uses his astral form to get through the energy shield. He comes face to monitor with the Omegatron. The others come smashing inside and it turns out their presence and fight will set off the nuclear stockpiles. Strange uses the Eye of Agamotto to manipulate Namor and Hulk, while freezing Omegatron in time, so that each moment is an eternity. Thus, it will take eons for Omegatron to actually trigger anything. Afterwards, the go their separate ways, with Hulk vowing not to return and Subby inadvertently gives them the name Defenders. Thoughts: It's not the greatest first issue in the world; but, it is okay. Really, you wonder why Strange needed Hulk or Sub-Mariner, as the Eye of Agamotto saves the day. That is the problem of a team with that much power; it needs threats that each member can't defeat alone. Thankfully, the next story provides just such a threat and pretty much seals the Defenders future. Ross Andru's art is fine; but, Bill Everett's inking is awfully rough. I don't know if he was off the wagon here, or what; but, it's not his best work. The main story is followed by a Sub-Mariner reprint, "Sub-Mariner and the Icebergs," where a misunderstanding and an itchy trigger finger nearly cause the nuclear destruction of Atlantis (foreshadowing their later fate). 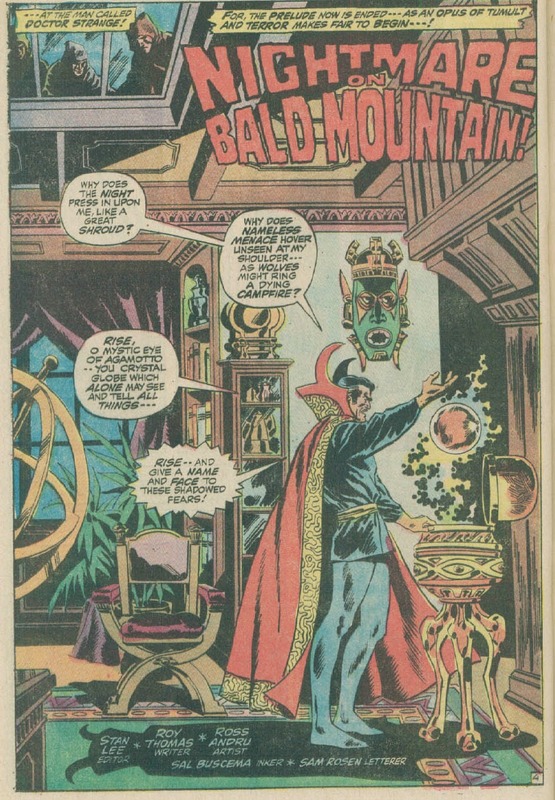 That is followed by the story of how Stephen Strange ended his wandering and faced himself; or, rather, Baron Mordo, disguised as the masked Dr Strange and defeats him, reclaiming the mantle of Sorcerer Supreme. This feeds back into the main story. 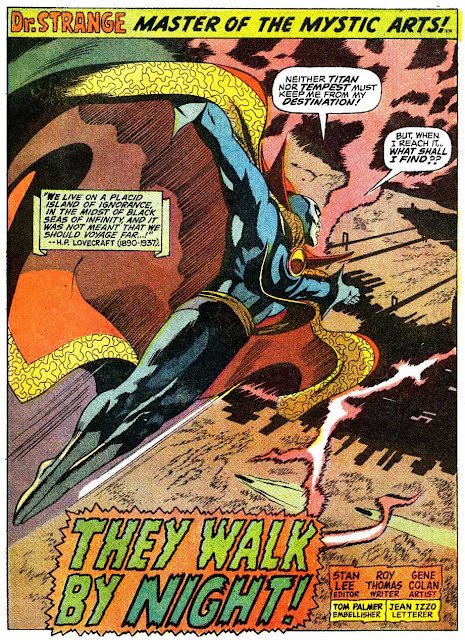 Dr Strange 177 (1968) to Marvel Feature #1 (1971). 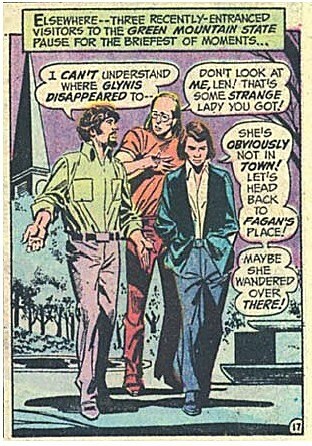 At the end of Hulk #126, Strange goes off on a sabbatical, away from magic. In Marvel Feature #1, he returns home to find Dr Strange there, with Clea and Wong. They battle; but, Dr Strange defeats him, thanks to his cloak. 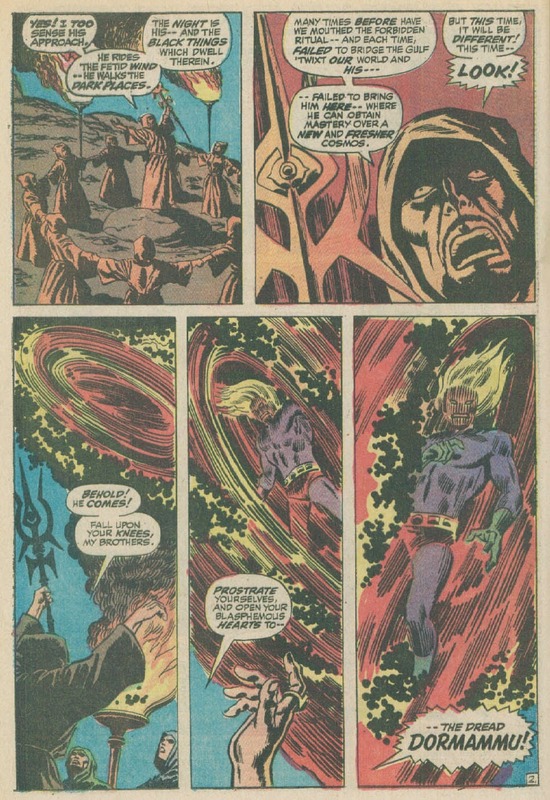 Stephen summons the Ancient One, who helps release him from Strange's spell. He then defeats Strange and unmasks him as Baron Mordu, who had taken advantage of his absence to place himself in the Sanctum. The Defenders story opens after Stephen Strange is back as Dr. Strange. The story of it is right here. IIRC, it wasn't a physical mask that he wore, it was an illusion created by his magic. I'm finally on Facebook. Friend requests from CCFers are welcome. I've read that Everett was irked by the way Andru pencilled - lots of sketchy little lines instead of one continuous line. Inkers like Mike Esposito would just put in the continuous line, but Everett's way of protesting was to ink every one of Andru's pencil marks. Some people liked it a lot. Well, I don't know about elsewhere; but, here, it kind of makes everything look fuzzy; some pages more than others. Had I encountered this in the wild; I probably wouldn't have bought the issue. The second issue, with Sal Buscema inking, looks far better and is a favorite of mine. 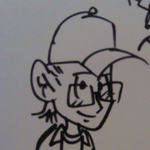 It also helps that Roy has a better story, that time (and a cameo). Creative Team: Roy Thomas-writer, Ross Andru-art, Sal Buscema-inks, Sam Rosen-letters, Stan Lee-handing out the treats. Meanwhile, Roy and Jean Thomas arrive in Rutland for Tom Fagan's annual party and the Rutland parade (more in a minute). He feeds them some ghost stories and Rascally Roy soaks them up and shivers. Wuss! Subby and Hulkie shield Clea and Wong, as all Hell falls in on the mountain. The bathrobed twits get smooshed and Strange whoops Dormmy enough to get away and pulls Clea and Wong out of the line of fire. Subby and Hulk emerge from the rubble and the gang goes down to get some popcorn balls and circus peanuts. Thoughts: Now this is how you craft a classic. The title, "Nightmare on Bald Mountain," is an homage to the Mussorgsky piece; and, especially, the use of it in Fantasia, as Tchernabog is manifested and then disappears. Instead of the winged guy, we get ole flame-head Dormammu, he of the goofy name. Dormmy was one of the earliest big threats that Ditko created for Dr Strange and one of the scarier ones, in Ditko's hands. Andru and Buscema do a decent job of continuing that her, though purple long johns do not a scary demon make. Thomas is clearly having fun, right down to inserting himself and then-wife into the story. Buscema makes a nice addition to Andru's pencils and this one looks a heck of a lot better than the Everett piece in the last issue. Buscema begins his long association with the Defenders here, though he isn't yet a regular. 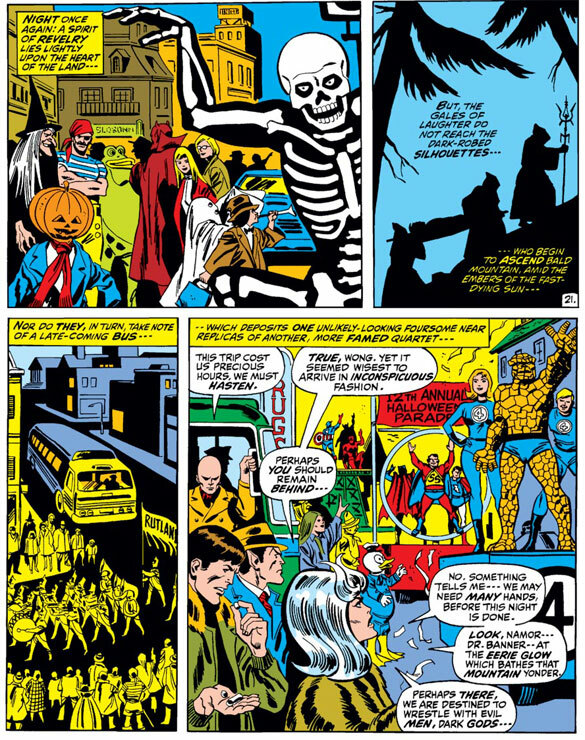 The Rutland, VT Halloween party and parade was a standard bit in comics of the early 70s. 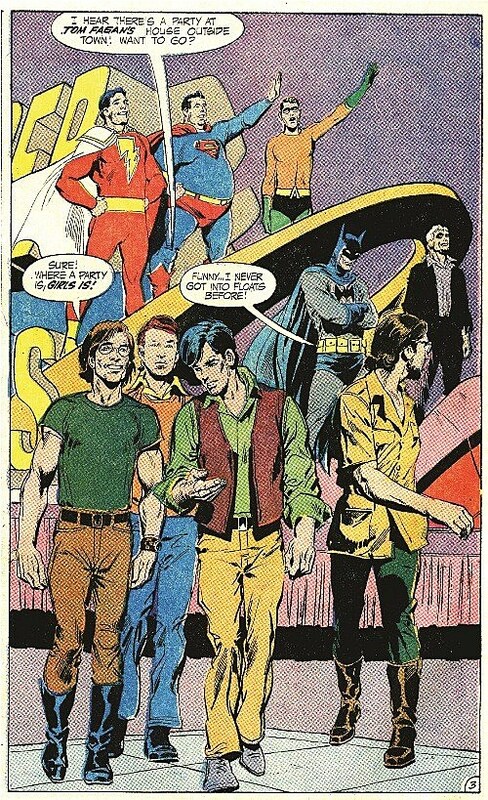 Tom Fagan was a fan and had connections with creators at DC and Marvel and had a big party in a mansion/big house, every year, with many of the writers and artists joining the fun. 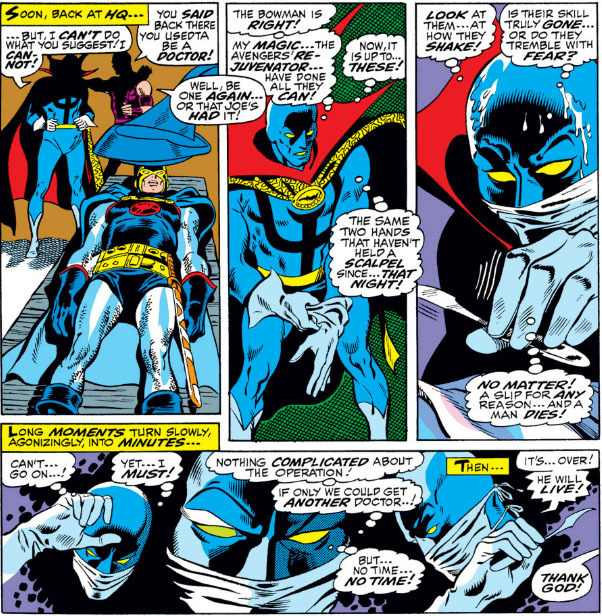 It was worked into comics in Avengers 83, with the first appearance, then turned up in Batman #237 (Night of the Reaper, with Neal Adams art), here, Thor #206-207, JLA #103, Amazing Adventures #16, Avengers 119, Thor 232, Dr Occult #18, Freedom Fighters #6, JLA 145, DC Superstars #18. Ghosts #95, Defenders #100, Thunderbunny #5, Animal Man #50, Generation-X 22, and Superboy and the Ravers #16. Generally speaking, the parade sequences were drawn with the figures on the floats obviously being party goers in costume, rather than the real characters, to keep them from getting into too much trouble. Tom Fagan passed away on Oct 21, 2008. His last wish was to ride in the parade in a casket, if he died close to the event, though the family thought too much time would elapse before the parade and his body was buried. The parade continues and celebrated its 50th Anniversary the year after Fagan's death and will celebrate 60 years, next year. This is probably my favorite early Defenders story, before Steve Gerber started working his magic. It's a nice mix of mystery, mood, fun, humor, and excitement, with excellent art and writing. Just beautifully crafted all around. Synopsis: A capsule, the Castor & Pollux-1 (no way NASA would use a name like that), is heading for splashdown, when it falls into a whirlpool and gets sucked under the ocean. 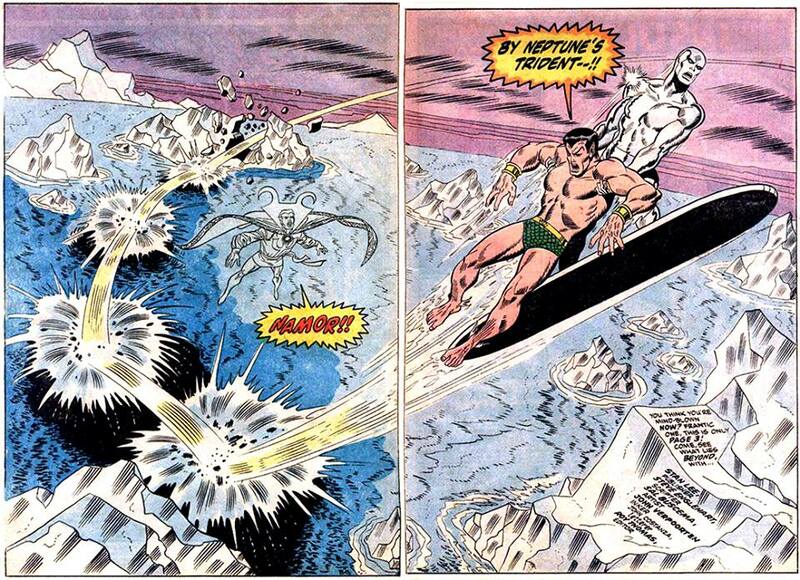 Namor just happens to be nearby and he dives down to rescue it, and has to fight off a giant squid. The recovery carrier races over, with Gen Thunderbolt Ross and Jim Wilson (the young African-American man who can sort of calm the Hulk) on board. No real explanation why an Air Force general is on a Navy carrier or Ross is wearing an Army uniform. Subby brings the capsule up on the flight deck (which has a wooden deck, despite that being phased out after WW2) and some swabbies give him lip and he retorts and fists start flyin' Wilson is able to calm things and then the astronauts come out and bad mouth the space program and announce they are quitting to become tv stars!!! Neil Armstrong they ain't! 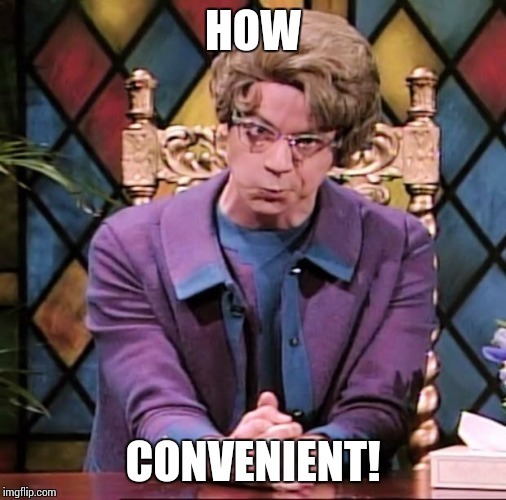 The jokes are far lamer than anything the Greek brothers ever created, yet kids can't help watching. Xemnu (whose name sounds vaguely Hebrew or Babylonian, and seems to wear a metal yamulke) has a mesmerizing gaze and talks about taking the next rocket back to his magic planet. Jim Wilson thinks something is up; and, since the Hulk is AWOL, goes to consult Dr Strange. They go down to check things out, with Strange disguised as the Hulk and con their way into appearing on the next show. It is broadcast from Cape Canaveral and Bruce Banner sees the fake Hulk on tv and gets mad, turns into the Hulk and punches the tv. 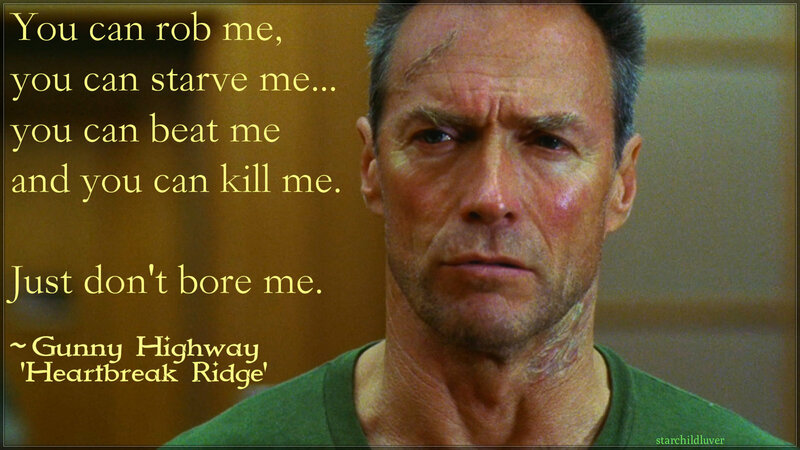 He then smashes out of the diner and goes to find his agent. Xemnu turns on the whammy and kids start acting like zombies and march towards the Cape, straight at the electrified fencing. It is turned off in time, as the tykes scale the wire. Meanwhile, Strange attacks Xemnu and gives us the back story how he was last defeated and turned into a mist, which earlier seemed to envelop the CP-1. He inhabited one of the astronauts and launched this hokey scheme. (Hokey Smokes!) Namor shows up and attacks, then the Hulk shows up and attacks and beats Xemnu down until he dissipates. 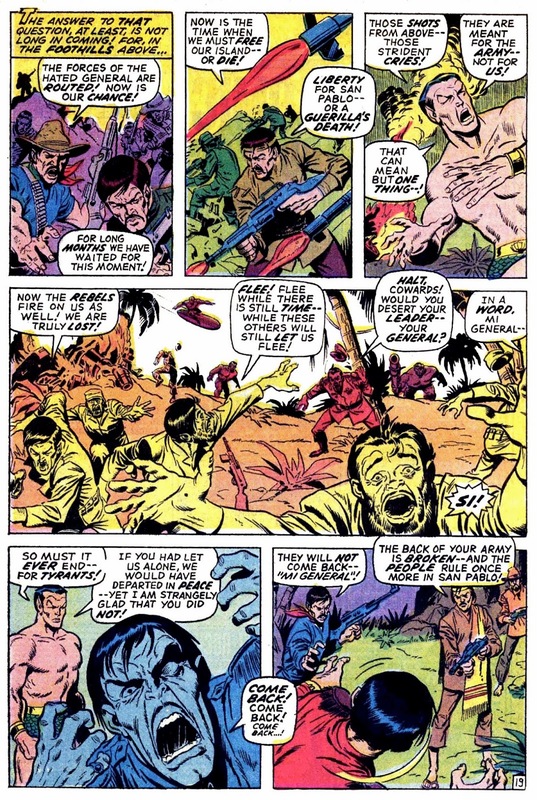 The Army then turns their weapons on the Hulk; but, Subby hits them with big waves, allowing Ol' Greenskin to escape. Strange and Wilson watch as the awakened kids head back home. Thoughts: Um........................that was different. Overall, it is a pretty weak story and is pretty goofy. In a way, it sets the template for what Steve Gerber would do on the book, except Gerber was a heck of a lot funnier and would throw in real satire in his stories. Roy is more just poking fun; but, he's pretty hit and miss with humor (beyond certain characters). He did it better in the FF, with the Hulk than he's accomplishing here. The Andru-Everett team is back and it looks better than the first issue; but, nowhere near as good as Andru and Sal Buscema. Thankfully, this pairing wouldn't carry over to the new series. The art looks more finished, though a bit light on the blacks, in some panels. Other panels look very strong and the pair are very expressive, with the tv stuff. The military stuff is pretty bad, though I doubt the average Marvel fan noticed. Next up, the Defenders get their own series and Marvel Feature gets turned over to Ant-Man, for the next 7 issues (with the last two featuring the Thing, in a try-out, before launching Marvel Two-in One, cluding the debut of Thanos, in issue #12). I love the Halloween party 'crossover'.. it shows a sense of fun that is mostly lost these days. Creative Team: Steve Englehart-words, Sal Buscema-pictures, Frank Giacoia-inks, Artie Simek-letters, Roy Thomas-new, but unannounced Editor. Hulk tries to check on Namor; but, can't touch him, so he goes to find smart-friend Magician, to help Fish-Man. He stomps into New York, causing a panic and Strange turns up. Hulk lets it slide that he is still mad that Strange made puny humans laugh at him (in MF #3). Namor is surrounded by mystical energy and, suddenly, Necrodamus appears (Nostradamus' little brother, no doubt). Meanwhile, Omegatron, from Marvel Feature #1, had broken Doc's time spell and is back to counting down doomsday. Doc meditates to think and Hulk pounds on the barrier to wake up Namor. Doc snaps out of it, tells Hulk to watch over Subby and covers them with the Crimson bands of Cyttorak. However, namor sinks into the ground, 'cause Doc only covered them up top. Hulk and Strange go down into the caverns below to get Namor back. They run into a big demon and Hulk smashes it, then they find Necro, about to sacrifice Namor. Hulk attacks, Necro powers up and they fight. Doc tries to wake Namor and succeeds, just as Hulk gets a mystic knife in the pecs. Namor attacks, but gets bested, then Strange helps stop the knife from plunging in and Banner joins the fray (Hulk changed back, after the knife slid in). They prove strong enough to delay Necro from slaying Namor as the stars align, blowing his one chance to open the door for the Undying Ones. Necro bugs out and the three Defenders catch up and Namor reveals that the Silver Surfer is the one who knocked him out of the sky. So, they go to find him. Thoughts: Lot of recap here, and a lot of mystical mumbo-jumbo, with another guy in a bathrobe. Dr Strange proves powerless, until he isn't and he saves Namor. That happened a lot when Doc was around and was part of why I was lukewarm to him (depended on the hook of the story). Ditko at least dazzled you with his weird designs and Doc tended to earn his victory more. Englehart does tie into past history and moves us forward into an intriguing new direction, as next we go to find out why Surfer blasted Namor out of the sky. Its a bit too soap opera surprise reveal; but, it works well enough. Sal's art is nice and dynamic throughout and he begins his long, regular tenure with the series. At this point, Roy had been promoted to EIC, while Stan became publisher; but, it wouldn't be formally announced until the next issue. It is teased in the Bullpen page and the letters column, with it saying Roy had moved onto something new and big. Creative Team: Steve Englehart-writer, Sal Buscema-artist, John Verpoorten-inker, John Costanza-letterer, Roy Thomas-Lord and Master, after Stan. Surfer asks how the dudes are doing and he is ready to rejoin, since he has found the Earth worthy of protecting (well,, THANK YOU, Mr Alien...). Subby is still POed about getting thrown from the sky, last issue, and punches the Surfer in the mush. Surfer leaves in a huff. Namor and Strange head back to NY to try and locate the hidden valley that the Surfer mentioned (it's in the condiment aisle, of your local grocer!). Strange pulls out the diary of Kenneth Ward, which describes a hidden Himalayan valley, where he encountered the Undying Ones. Strange thinks that is where Surfer is headed. The find Hulk along the way, who is whining about losing Jarella, and Namor mentions Necrodamus and Hulk changes his tune. Doc gives Hulk the levitation cloak and then rides on his shoulders, to the other side of the world. They meet up with some Sherpas or other Himalayan group, who run off afraid. They use a spell to calm them and disguise themselves in furs and parkas. The gang leads them on to the valley of the Undying Ones; but, they disappear in the night. The trio follows big footprints towards the valley, where they encounter yeti and a fight breaks out. Then Surfer shows up and puts himself between the defenders and the Snowmen. 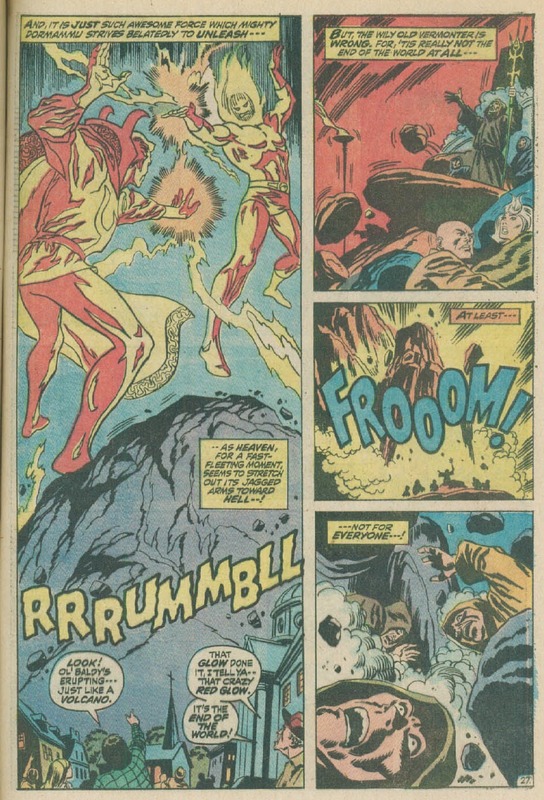 Subby attacks him and brings up Surfer tossing him, aiding necrodamus and Surfer denies it, claiming to have been in the valley since the FF last sent Galactus packing (FF123). he decided to be the Cosmic Peace Corp and find a primitive group to help and found the yetis. Doc explains what happened to them and the yeti attack. They turn into some dude, named Calizuma and a bunch of warrior wizards. Hulk smashes, Namor swats, Strange magics, and Surfer cosmics, scattering them like ten-pins. They all smoosh Calizuma, then waste the rest of the bunch. Surfer then whines about Zenn-La and Shalla Bal and Strange says he can help him. oh, and the Doomsday clock that was reactivated last issue is still ticking down. Thoughts: Not the best resolution to a mystery I have seen. Calizuma doesn't turn out to be much of a threat, despite what you see on the cover. He only gets to attack in two panels, before he gets gang-smooshed. The cover makes him out to be Dr Doom, or something. Despite the continuing nature of these two issues, it doesn't really feel like a tightly linked story. We'll have to see what next issue brings. Sal is in pretty good form, though. Englehart is still kind of green, at this point. He will have bigger things, in a bit. 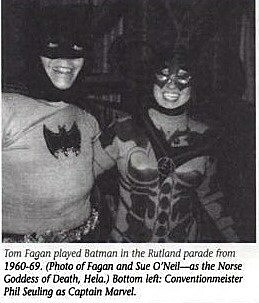 I love those Fagan/Rutland issues and made a point of reading all I could find last Halloween. Namor and Doc are searching for the Silver Surfer, and have been for two months (since the series was bi-monthly, at this point). This raises an interesting-to-me point. 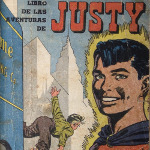 Modern comics, with all their decompression, are quite clear that a story that takes several months to be serialized in comic book form may just take a few days or a few hours of in-story time. Was that different in the Bronze Age? Obviously multi-part cliffhanger stories didn't have a month between cliffhanger and climax. But under ordinary circumstances, did they tend to assume a month between stories? Am I the only person who finds most of the Rutland stories to be insufferably self-indulgent? It started off as a okay one-off joke, I guess, but for me is kind of emblematic of the worst of the 70's laziness and excess by writers (who often had no editorial oversight since they acted as their own editors). These stories are right up there with Cary Bates making himself the focal point of the JSA-JLA crossover.